LAKELAND, Fla. — CSX has now missed two deadlines for the Lakeland railway crossing construction to be completed. First, the company promised the City of Lakeland that construction would be complete by last Friday and it would be back open by Monday. Then, it told the city it would be done by Tuesday, and the city would be able to lay asphalt and have it open by Wednesday or Thursday. But, as of Tuesday afternoon, the construction isn’t nearing completion. “We are glad workers are here but we don’t think it’s going to be anytime soon,” Kevin Cook, with the City of Lakeland said. Now, it’s starting to affect business owners, their bottom-line, and some even say it has physically damaged their businesses. “I started stepping on glass and I was like ‘oh why is there glass down here’?” Randy Borden with Lkld Live says he was taking photos of the construction when he first noticed the damaged. His music and tv studio sit right along the railway tracks that are being replaced. “And I look up at my window and it’s busted out,” he said. Borden says he estimates about $3 to 4 thousand in damages. His front door was shattered, a window facing the tracks is broken and dents speckle the outside of his business like pockmarks. “Luckily my sticker was holding it together but it had been hit twice by rocks,” Borden says it was fixed shortly afterwards by Lakeland Glass and Mirror but he’d like if CSX could pay him back. When he asked on-site construction managers what to do, they pointed him to the incident numbers posted along the tracks. When Borden called those numbers CSX personnel referred them to a website to make a complaint. He has yet to get any answers. ABC Action News visited the site again on Tuesday and there were workers out there but construction looked slow-going. Many workers and shoppers were still having to cross the dangerous construction to get back and forth from the downtown area, including a mother with a stroller and an elderly couple who had to find their way around the mess. “If you think about it, you have three major thoroughfares that go north, south through downtown and two of them are blocked,” Cook said. 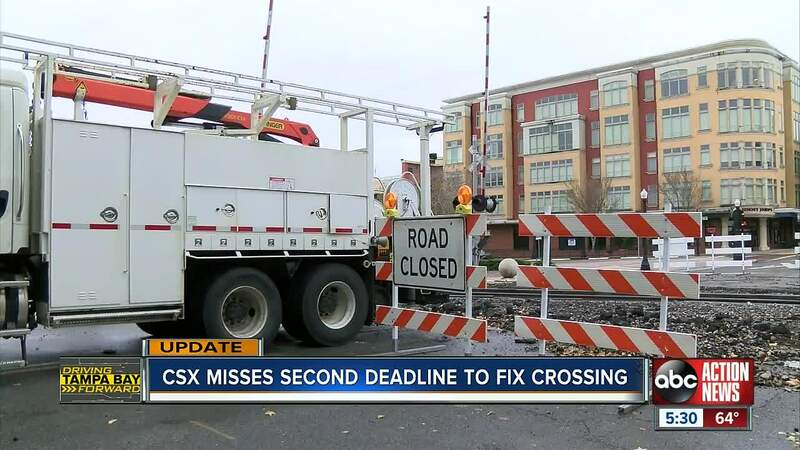 Cook also added the city is trying to expedite the construction and even took the situation of debris into their own hands, having crews remove a large amount of concrete blocks, railway ties and other construction garbage CSX had lying around. On top of that, drivers are frustrated. One driver even tried to make it over the tracks Monday night, but got stuck on the train tracks. Cook says they are hoping the construction is done by the end of this week but isn’t making any promises.